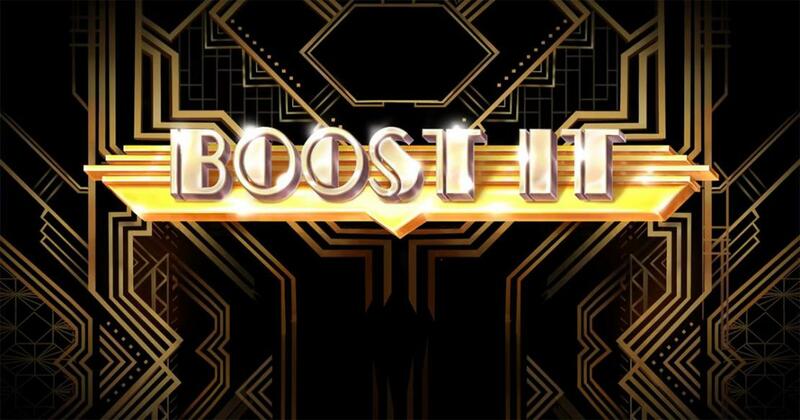 Boost It is an Art Deco style slot, which comes with classic fruit symbols for the most part, as well as some impressive top rewards. Coming from Sthlm Gaming, Boost It has an interesting mix of classic elements and modern features to offer. While the style in use comes from the 1920s Art Deco movement, which has been present in several slots already, when it comes to the chosen symbols you will discover a lot of the classics. This includes Royals which have various decorations, but also images of diamonds, cherries, 7s, clovers or the Bar logo. There is no symbol in there that will be truly interesting or new, or even connected to the time era from which the inspiration came for the design style. It does look good though, despite the chosen symbols, and that tells us something of the graphics quality. This slot machine, with its 243 ways to win present on 5 reels, is capable of delivering wins of 8100x the stake. For the big features that it delivers, there are wild symbols, multipliers and a Booster Reel to bring them to you. It’s a standard betting range that you’re going to find in Boost It. The game uses 25 coins, and has their total value set to a range of $0.25 to $100, which indicates a coin value of up to $4. Expect to find a slot machine which has a Booster Reel at the top, one where you can find various extra features if you’re lucky. Those Booster features can include multipliers of 5x for a selected symbol, 2x to 10x for all wins of the round, wild reels on one of the last four columns, or random wilds. The biggest potential for the game will obviously come from this side, especially when the 10x multipliers come at the right time. The two versions for the wild symbols will have them added either as Wild Reels (3 symbols high and covering a full reel) or as regular wilds (one symbol which substitutes for all other icons). There are no regular scatters or free spins to be had here, nor bonus games, so the focus of the slot’s features is entirely on that Booster Reel. Boost It has excellent payouts to give away, but obviously it’s not going to be easy to get a reward of 8100x the stake. Expect this to be a game of high volatility. Try of out a demo version of Boost It.